The well known Import label “AudiRec” is back with a very nice and special 4 CD box, titled “THE ASHEVILLE MARATHON” (AudiRec AR 197507234-2). Hear three of the most unusual Elvis Presley Shows of the 1970´s! When Elvis came to Asheville, NC in late July of 1975 to play the final shows of his running tour, he was indeed in a “giving” mood. Elvis delivered a whole bunch of rarely performed song material and handled a big part of them in a kind of “Elvis By Request” style. Since his Record Company RCA was not on hand to record these shows professionally, we can be thankful that fans did record the shows at least with private (non-professional) equipment. One thing is clear: It would have been a big pity if none of those three shows would have been recorded and therefore been “lost” forever. In July 1975, Elvis played 21 shows in 11 different cities. This tour was rated as being one of the very best in Elvis' last years. His powerful vocal delivery, his entertaining mood and his willingness to improvise various unusual songs are what make this tour such a stand-out, and the final 3 shows in Asheville, NC were simply stunning! In Asheville Elvis also played the longest shows of the tour and performed many rarely sung songs. He was kind of promoting his new album “ELVIS TODAY” with “Shake A Hand”, “Fairytale”, “T.R.O.U.B.L.E.” and “Pieces Of My Life”. More than any time before he was interacting with his audience, singing songs by request. For example “Memphis Tennessee”, “An American Trilogy”, “Heartbreak Hotel”, “Jailhouse Rock”, “Something”, “Return To Sender” or “Wooden Heart”. Elvis was in a hilarious mood. He gave away several golden rings and a fan in the first row - Mike Harris from Asheville - was lucky to get Elvis’ Gibson Ebony Dove guitar! It was the famous guitar which Elvis used in Aloha From Hawaii. Later in the show, Mike Harris thought Elvis was gonna ask for the guitar back, but Elvis leaned down and said: “'No that's yours. I gave that to you for a reason, and it's gonna help you out some day.” These shows were previously released, but all original releases are very hard to find now. Instead of doing a simple “copy & paste” job, we have asked our friends from SA to help us to enhance the sound from scratch, so we are sure that those shows never sounded better! The release is presented in a strong and stable 25 x 14 cm de-luxe 4 CD Long-Box accompanied by a 16-page booklet, filled with a great collection of photos taken in Asheville and press reviews. To make our release even more attractive for serious collectors, we present it in 3 different variations. It means 3 different covers and each cover´s got its own disc labels, too! The content of the CD´s does of course NOT vary! Choose the one version you like most or “collect all three”! In any case do not miss the opportunity to own your copy / copies of “THE ASHEVILLE MARATHON“! 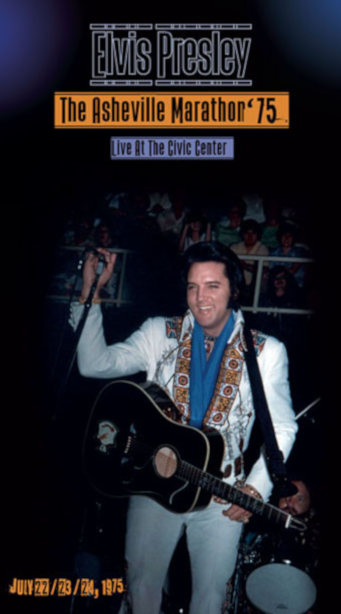 It’s the ultimate release of Elvis' magical July 1975 Asheville shows!